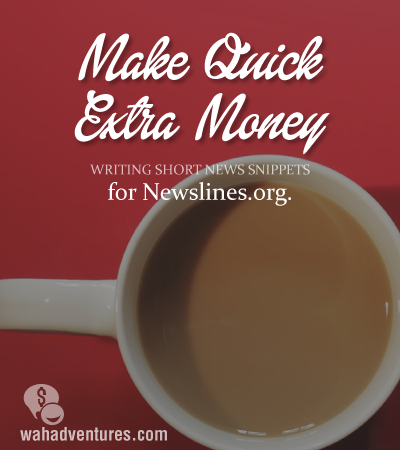 Newslines is a new site that pays you to write 50 to 100 word summaries about news stories in a particular timeline. For example, there are Newsline about celebrities, televisions shows, events, and more. A celebrity newline might list happenings in the life of movie star Tom Hanks, and an event newsline might include everything that happened in the 2014 Winter Olympics. You can either add to an existing newsline or suggest starting a new one. Each submission must be the 50 to 100 words and include a quote and an image or link to a YouTube video. Where Do Writers Get The Information? Online! No wiki or biography sites are allowed, but news sites and other types of sites are. If English is your native language and you can write with proper English spelling and grammar, you are set. No experience necessary. You will also need to have a PayPal account to receive payment. Pay at Newslines is $1 per post via PayPal, payable after the account reaches $20. They say on the website that if you need payment before your account reaches $20 to let them know and they will work it out, but they are growing fast so that may not last long. The chatter around the web is that this is a great little egg. They seem to be approving submissions quickly and paying quickly after payment request is received, even overnight in most cases. There are threads in forums like workplacelikehome.com if interested in researching more from experienced newsline writers. Here is the thing. It appears this is currently a one-man-show and word is getting out. There could be major slowdowns in submission approval and payment turnaround if it grows too quickly. That doesn’t mean it is a bad egg, it just means that it may be in a honeymoon phase and how it will all turn out remains to be seen. There is also the fact that while submissions are short, it can take a fair amount of time to find the information if you do not already know what you are writing about, and the link, image, and quote hunting can be tedious. It could quickly turn into more work than $1 is worth. I say proceed with caution. No harm in checking it out and seeing if you can work quickly enough to make it worth it, but be aware that there could be some hiccups as they grow. As of this moment, the link to get started writing news snippets at Newslines is not active. We are not sure if this is because they have haulted adding additional writers or if there is simply an error on the site. Please check http://newslines.org to learn more and see if they are accepting new writers.